The year of 2019 is a significant one for Omega, and not just because of a certain 50th anniversary. It is also commemorating 125 years of the brand. The first significant new release to mark this is the new De Ville Trésor 125th Anniversary Edition, an elegant new yellow gold model with a deep burgundy domed enamel dial. Inside the 40mm sized case is the manual-wind Calibre 8929 (base calibre 8511), a certified Master Chronometer movement with a co-axial excapement. It beats at 25,200VPH, and has a power reserve is seventy-two hours. One particular ‘anniversary special’ of note is that it has an 18 carat Sedna gold balance bridge with Côtes de Genève. 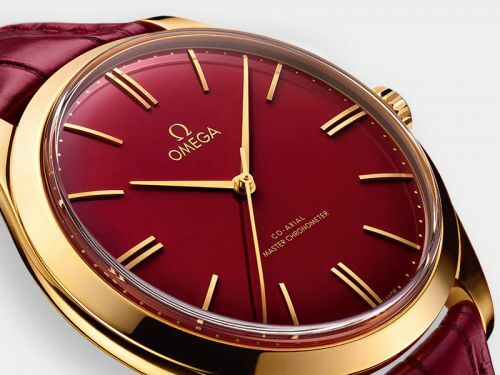 The caseback has a yellow gold anniversary medallion filled with red enamel, surrounded by decorative damascening (aka ‘damaskeening’) engraving, a type of engraving decoration linked to the heyday of the American watch industry and used for the 19-ligne Omega calibres of times past. This form of decoration was also seen in early American pocket watches. Although it is not a limited edition, it is nonetheless boutique-only. The RRP is USD 17,800.